I’ve only watched Doctor Who a few times, but I appreciate the episode “Blink” for its tense atmosphere and genuinely scary antagonists. However, the best part about it was that it used the Tenth Doctor sparingly and focused almost exclusively on a one-shot protagonist rather than the series’ main character. One Punch Man volume 14 has taken a similar approach with the conclusion of one of its longer arcs, putting the center focus on a relatively minor character in the series and making it one of the more poignant moments in the manga so far. While I adore One Punch Man and have recommended the series to everyone interested in the first season of the anime, I’ve taken a disliking to the current tournament arc that’s been present in the past few volumes. Hey, remember Garou, the hero killer that’s propped up to be the next big villain after Boros? Yeah, let’s shoehorn in more than a dozen chapters before we resume the arc! Considering it’s taken more than a year to conclude this storyline, I was a bit disappointed with the plot that Saitama registered as another fighter in order to participate in this tournament, all the while the Monster Association was trying to recruit new humans to mutate into monsters using monster cells that can be consumed by humans. This volume is a culmination of that arc, as Saitama has left the arena and monsters have started to attack. The previous winner of the tournament, Goketsu, has transformed into a monster, and has given the contestants an ultimatum: Turn into monsters themselves using monster cells or die by his hand. While some fighters stand their ground, others succumb to the temptation of power and turn into hideous creatures. Tournament winner Suiryu, who has just been humbled by his loss against Saitama, struggles against his superpowered opponents as he continues to get pummeled. However, because of this experience, he begins to understand the goodness behind the Hero Association (as he previously hated heroes and only wanted to be powerful). The first few dozen chapters of One Punch Man were a straight deconstruction of the superhero genre, and the first season of the anime adapts this concept very masterfully. However, by the time the first major arc finishes up, it delves back to a regular series due to the hilariously overpowered strength of our protagonist. It comes to the point that villains are introduced and built up only to die in… well, one punch. With this volume, it’s no different, but rather than a silly show of strength, these chapters focus on the character development of a rather minor person (in the grand scheme of the series). Saitama is out of the picture until the very end, and oddly enough, the manga at this point benefits from the absence of our superstar if only to shape up the supporting cast. 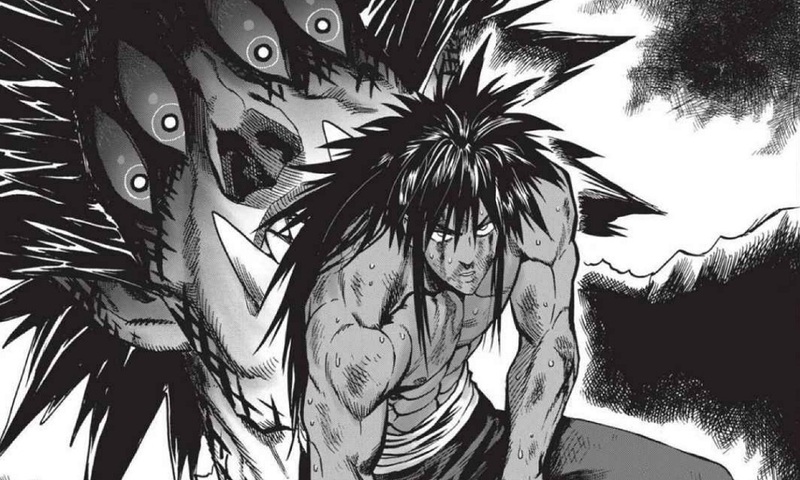 I legitimately dismissed Suiryu as a pompous meathead that only cared about fame, but this volume shows his more human characteristics, specifically fear. What does a man do when he’s faced with impending death? What will he do when the only people he can count on cannot help him? While it’s excruciatingly hopeless and suspenseful, there still is a great amount of action scenes present within the volume, if only to hype up the threat of a location without heroes. The setting that One Punch Man takes place in is established to be a dangerous one, and we get to see this up close. The humans turned monsters are grotesque and increase the sense of helplessness of the remaining fighters. This is accentuated in hope spots where our protagonists seem to have the upper hand, only for the tables to be turned at the last second. It’s this human side of the series that we seldom see, and really shows the hidden depths that One Punch Man can have. Also peculiar is that it doesn’t lose its humorous, satirical edge, as the over-the-top concepts still remain while still keeping in line with the tone of the current situation. For example, one character turns into a monster because he thinks psychoanalysis as a fighting style is stupid, and opts for brute force. He’s promptly disposed of, which is a humorous aside to what happens next. It’s so suspenseful and masterful that I was actually kind of disappointed that the conflict wrapped up rather predictably (as per the series). It’s odd that Saitama’s abilities would be a detriment to One Punch Man, but in his late appearance, it actually detracts from the tense atmosphere previous chapters provided. I couldn’t imagine another ending for it, but I really wished it could have been resolved some other way. One Punch Man Volume 14 vindicates a rather cumbersome arc by concluding it in one of the most heart-wrenching ways possible. Volume 14 a unique surprise that reignited my interested in the manga again, and I can't wait for future chapters.